Hopefully you're listening to the theme song from NBC television's "ER" show. Before I go any further I decided to share some very humbling awards I have received for this particular page. While these awards are posted on my AWARDS page I thought it might be nice to post them on this FD-EMS page also since they really pertain to mainly this page. Having been a volunteer member of the Midway Fire Department and Rescue Squad for the Town of Colonie in New York from 1988 to 1991 I was proud to serve my community. I would have stayed longer but my back injury ended that dream--for a while at least. 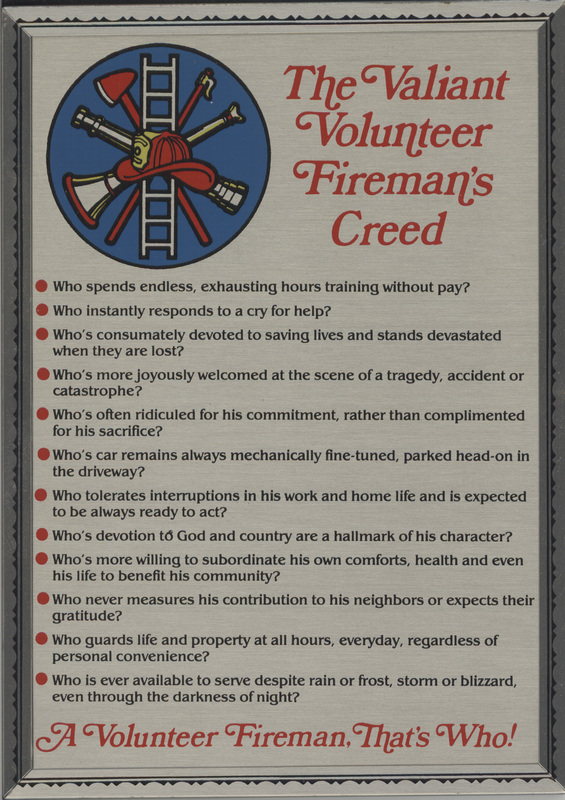 I hope to return one day, if not as a Firefighter & Emergency Medical Technician then perhaps as a Fire Police officer. I joined the department as a Firefighter. Ever since I was real young I wanted to be a Firefighter and this was finally my chance. Midway was recruiting volunteers so I offered my services. 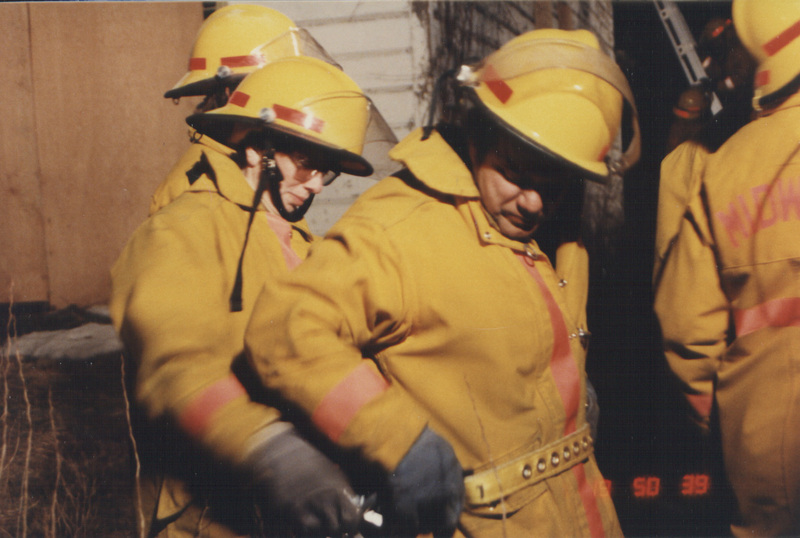 I was soon being trained for both engines and ladder trucks. I took part in several fires and rescues. One of the enjoyable things we did a couple times each year was to march in the various parades. Especially interesting was the fire association parades as we had to look our best in an attempt to win trophies. 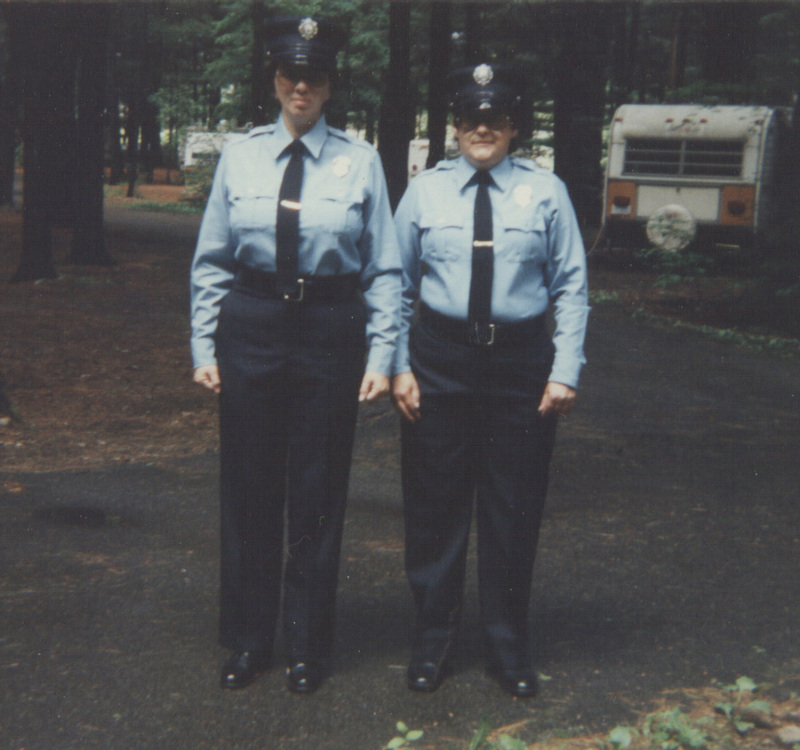 Here is one photo my mother took of my friend Belle Pellegrino and me before the Fire Parade held in Lake George, NY that year. Photo by Jean Falcone. Click on it to see it better. Here's a photo of me in my turnout gear. Before long I was asked to also ride with the Rescue Squad and soon found myself being trained as an Emergency Medical Technician. I went on many ambulance rides and experienced many interesting things. I helped treat patients, save lives and lost a few but that happens sometimes. I also got involved with training the ambulance drivers to be better, safer drivers. 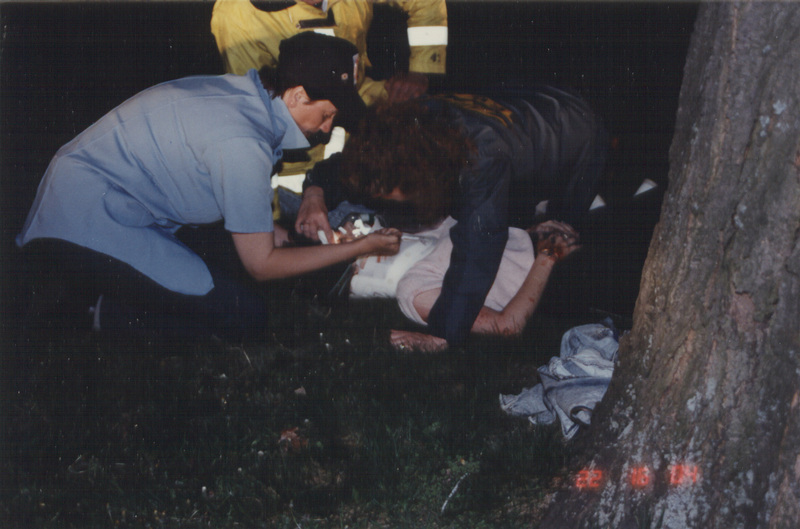 Here are photos of me hard at work at an accident scene--sorry its dark but it was quite late at night. That's me in the light blue shirt and ball cap! I'll be adding more things to this page soon but meanwhile please visit the following links. They will take you to some extraordinary websites about Fire Departments and Emergency Medical Services across our great country. Emergency Services, Town of Colonie, New York This is the town where I live! FASNY Fire Museum of Firefighting New York This museum is an hour south of me in Hudson, NY! FDNY This is the official webpage for the Fire Department of New York and has a lot of important information as well as links to memorial pages to the members of their department who were lost on 11 September 2001 at Ground Zero when the World Trade Center was hit. FDNY Firefighter shirts, patches and pins A nice site for these items. Independent Lens - TAKING THE HEAT - PBS Finally the women of the FDNY are getting some attention for their hard work! Check your local stations to see this program. JEMS Connect--EMS Emergency Medical Services connection site! The Bradley Beach New Jersey Volunteer Fire Department Please visit this amazing website. The webmaster has certainly done a marvelous job for this department in not only honoring the men and women who belong to it but also showing safety features, a kids page, a tribute to lost firefighters both in their department as well as those lost at the World Trade Center in NYC on 11 Sep 01. 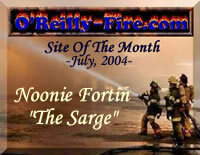 O'Reilly-Fire Home on the web Janet O'Reilly Herron, the woman who created this site, is involved with the Fire Service agency in Utah. BUT she is also from a patriotic family and is involved with the POW-MIA issues. Women Firefighters' Resource Page A good site! Use any of the buttons above to go to another links page. Let me know what you think about my page. Send mail to me below. Copyright 2003-2016 by Noonie Fortin. All rights reserved.